I cannot believe that 4 months ago we roamed through our first home for the last time to say goodbye. It seems like a lifetime ago and it turns out, I may be irrationally emotionally attached to our fabulous first home. These past 4 months have been filled with a number of life’s extreme ups and downs, which I am sure are fueling my current state of nostalgia! Despite our attempts at organization, selling our house quickly devolved into a hectic whirlwind of home improvements, decluttering, and cleaning. Oh, the cleaning. We were fortunate that our house was under contract within about a week, but then the packing and paperwork started. Boxes, boxes, paper, tape, boxes, and more boxes. We frantically packed away all of our belongings, struggling not to drift down memory lane with every anniversary note, wedding gift, or baby toy we rediscovered. We were so focused on the practical preparation, selling, and packing of our house, I am afraid we missed our opportunity to properly reminisce. Other than my childhood home, this was by far the longest I have lived in one place and it holds so many memories of major life milestones. Allen proposed on the kitchen floor of that house, we taught Rufus to “sit, stay, shake and speak,” we addressed our wedding invitations, we decorated our first Christmas tree as “Cavedines,” we purchased our first cars and subsequently watched them destroyed by hail, we transitioned in and out of jobs, we wrote papers, crammed for tests and graduated with our Masters degrees, we lovingly listened to the soothing sound of our new sump pump during spring storms, we endured a 9 month pregnancy and welcomed beautiful Samantha to our family, we celebrated 30th birthdays and a 1st birthday, watched Samantha take her first steps and learn to say ‘dog,’ and we travelled the world from the London and Rome to Taipei, Tokyo and more, with 7860 as our home. We experienced our family grow with the birth of nephews and a niece, we celebrated countless weddings, births, and birthdays with old friends, and developed incredible new friendships that continue to enrich our lives. We are absolutely in love with our new house… I mean, it has more than one toilet! We have zero buyers remorse and frequently find ourselves sitting around saying, “can you believe this is our house?!? We actually live here!” This house holds more potential than we ever imagine, but it is, however, difficult to let go of what our first home represents. 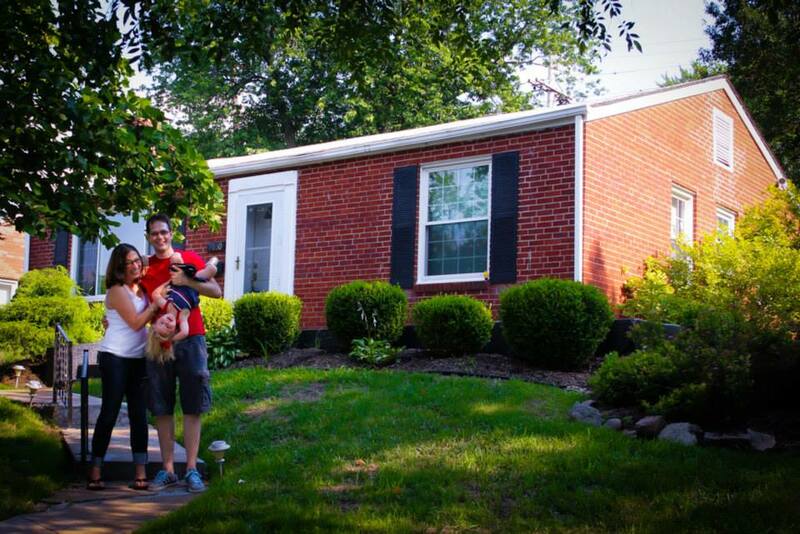 We put our heart and soul (and sweat and paychecks) into making that house our home. We proudly invited family and friends into our home and into our lives. While our new house is amazing, it does not yet have the history to call our own. We still have the painting, hanging, crafting, hosting, celebrating, mourning, and inevitable cluttering to break this house in and make it our home. As I find myself hanging out down memory lane, it is time to take a step back and remind myself that I am not attached our first home, but I am attached to the adventures we had and the life that we created in our home. It will take time to make memories in our new place, and I look forward to making the most of this amazing new house (with more than one toilet!) this fall and holiday season! Confession of a *wannabe* blogger… Apparently my Loretto and Jesuit roots are telling me it is time for some serious self reflection, introspection, motivation and action! Usually, your blogs make my mouth water over delicious recipes and gorgeous cakes, but this filled my eyes with tears. It is very heartfelt and sweet. With all your warmth, beauty, talent, and passion…for anyone who has the pleasure of knowing you…the feeling of being “home” is wherever you are, wonderful Annie. Thanks, Carey! I definitely didn’t expect a move to be so emotional! What an adventure!